Did you know that September is National Breakfast Month? Well, it is! We all know that breakfast is the most important meal of the day! It gives you the energy needed to jump start your day so you have enough stamina to make it through to lunchtime but it also revs up your metabolism. So if you’re trying to eat right, get good nutrition and even lose weight – cutting out breakfast just isn’t a wise idea. In honor of this special occasion I was invited to appear as a guest on KMOV, Great Day St. Louis. While there, I prepared a Blueberry Breakfast Parfait. This quick, easy and nutritional breakfast can be prepared in 10 minutes. In addition you can also view the Berry Smoothie (takes just 5 minutes) plus Whole Wheat Blueberry Pancakes (takes 15 minutes) I made. All three recipes can be prepped ahead, so if time is an issue in the morning, you’ll have no excuse now. 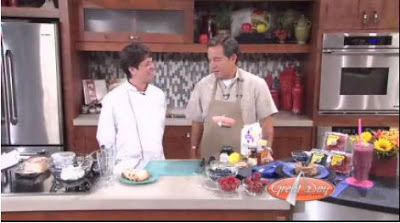 You can watch the video segment along with viewing all the recipes posted below. My segment starts at 5:11 (five minutes, 11 seconds). This Berry Smoothie is delicious. You can make it a day ahead, cover and refrigerate and it will be perfect to drink the next morning or for a midday treat. 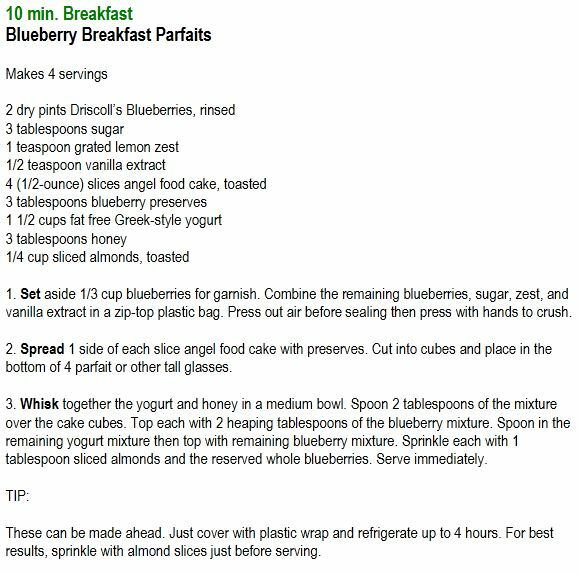 The Blueberry Breakfast Parfait below can be made with any berries you prefer. The demo above used blueberries. If you aren’t fond of blueberries feel free to substitute any other berry. 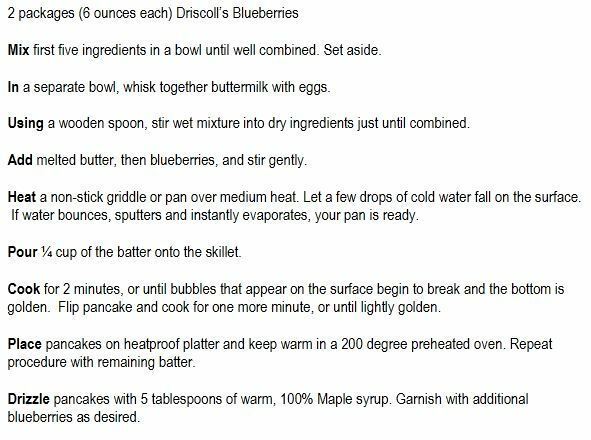 For the Whole Wheat Blueberry Pancakes, to reduce moring prep time, you can make the batter the night before, cover and refrigerate. The next morning remove from refrigerator and cook your pancakes. I hope you enjoyed the video and hope you’ll try these easy berry recipes for you and your family. OMG This is awesome! Congratulations! I can’t wait to see the video! The video is posted where it says, “video segment”. I was hoping to actually have to video box up but couldn’t get the code to embed properly so I provided the link instead. Hi Vicki! I was out of the house all day, although I was on the computer. I just saw the video….you’re a ROCK STAR! I love the recipe and the guy when he tried it…his eyes practically rolled back in his head! Nicely done and congratulations again! Thanks Ann, it was fun to do and the recipes really are wonderful. I love them all but the berry smoothie especially with the crystallized ginger in it. It gives it a unique flavor yet you’re not sure what it is unless you’ve made it yourself. It’s like the secret ingredient! The angel food cake was wonderful toasted and put into the parfait with the mix of greek yogurt/honey and the berry mixture – it was delish! A simple, quick and nutritious breakfast that I’m sure you’ll love. Hope you’ll try it. I have to say, the Driscoll berries make all the difference in the world if you can find them at your grocers, it’s well worth it! 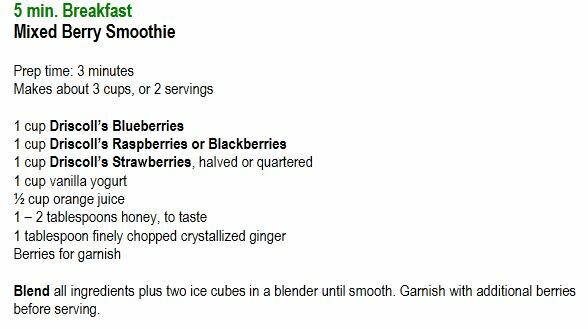 They were all equally delicious but I do love the smoothie especially with the crystallized ginger. Plus smoothies are great anytime of the day. I hope you’ll try it. As for my tv gig, it was lots of fun. Maybe someday I can be a natural in front of the camera. I have a ways to go but I’m having a blast learning. So nice to see you on a TV gig…every little bit helps for one’s career! …as for a career…”been there, done that”…too old for new tricks! It was a lot of fun to do and everyone on the set of Great Day St Louis was extremely nice. Congrats on your tv appearance! What a coincidence you just posted about blueberry breakfasts. I just had a blueberry muffin with streusel (not homemade, but still good). Thanks for coming by to catch up on my latest recipes, and yes I do love fall too! Though it will feel more like it when the temperature drops some. Still in the 80s here! @Lizzy – thank you Lizzy, that’s so sweet of you to say. I’m not sure I’m a natural but hopefully in time I’ll get better on camera. @Heather – thank you, it was fun! Your blueberry streusel muffin sounds great. I’ve been sitting here this morning trying to figure out what to make with my leftover blueberries from the tv segment before they go bad. I’m sure by days end I’ll have created something to post. What a great video – congratulations. You are so calm and really enjoyed watching. Great breakfast ideas. Thanks for stopping by le blog. Wonderful to meet you, Chef! Thanks Jill, I’m not sure how calm I was but I did have a good time doing it. This is SUPER COOL!! It was so nice to hear your voice and you in action! Congratulations on TV appearance! Parfait looks delicious!! Thanks Nami it was fun! All the recipes are positively delicious. I think my favorite is the smoothie but I love each one. They’re all simple to prepare, nutritious and delicious! Carrie you are so sweet. I’ve been thinking about you. Maybe we can get together soon! You did a great job! It is so fun seeing you in the clip! I have relatives in St. Louis so I am going to have to tell them that one of my blogger friends is on TV there! Where in St Louis are your relatives from?